A band of English Noblemen, led by the masked Scarlet Pimpernel, secretly conspire to rescue French noblemen from the guillotine of French Revolutionists. The French army offers 5,000 francs for the Scarlet Pimpernel, who is quite sneaky in his means to free these mostly innocent men. Rumor has it that the Scarlet Pimpernel has super powers which aid him in evading capture along with his team of men. 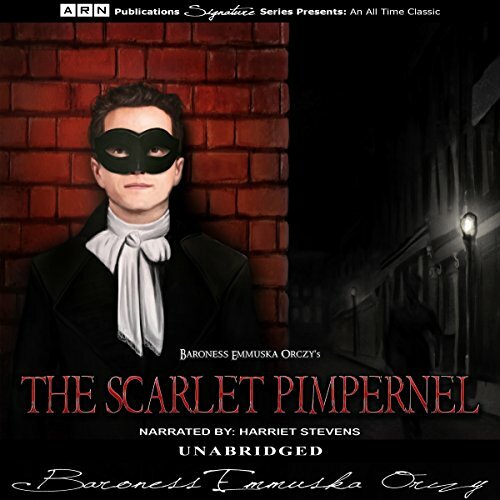 The Scarlet Pimpernel lives a double life, one as an English aristocrat, wealthy, and popular among society's elite, and another at night when he becomes a superhero and master of disguise to the French nobles he has vowed to save. To others, such as the revolutionists, he is something darker, and dangerous - a vigilante who must be captured and stopped at once. A love story deepens the mystery of the Scarlet Pimpernel even more, as a beautiful young wife will have to choose between her husband and her brother with his demands to discover the identity of the vigilante or face dire consequences. The Scarlet Pimpernel goes to great lengths to show that the mask you wear on the outside is not always an accurate depiction of who you really are on the inside. Shocking narrator. Sounds like a robot! Could not listen to this. I love the story but terrible narration. Do not buy this!